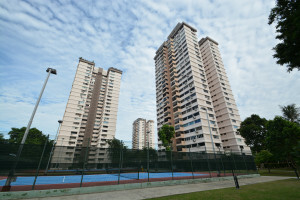 The 516-unit Laguna Park, located off Marine Parade Road, has relaunched a collective sale bid at $1.48 billion. The 40-year-old residential estate last attempted a collective sale in September last year with the same price tag. Two earlier collective sale attempts were made in 2007 and 2010. Including the latest estimates for an additional differential preium and lease top-up, the reserve price translates to a land rate of $1,231 psf per plot ratio. The differential premium is estimated to be $407.4 million for the intensification of the site to a plot ratio of 2.8, and the top-up premium for a fresh 99-year lease is expected to cost $420.7 million. Laguna Park is a 99-year leasehold residential estate comprising seven residential blocks and 12 commercial units, and sits on a 669,485 sq ft site. Under the 2014 Master Plan, the site has a gross plot ratio of 2.8 and a new development could yield 1,741 residential units of 1,076 sq ft.
“With Laguna Park over 40 years old, maintenance cost is expected to go up. Owners are open to achieving a sale by moderating their price expectations,” says Ian Loh, head of investment and capital markets at Knight Frank Singapore, the marketing agent. Located off Marine Parade Road, the site offers panoramic sea views and is near the upcoming Siglap MRT station on the Thomson-East Coast Line that is expected to open in 2023, says Knight Frank. The tender for Laguna Park closes on May 8.